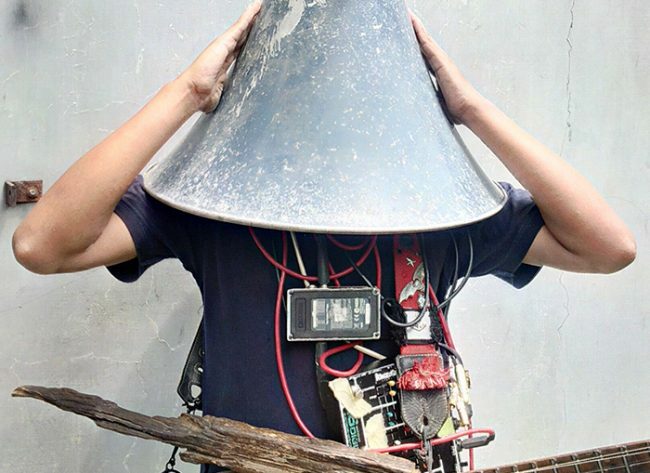 Artist, Musician, Guitar Explorer, Improviser and Sound Artist Ikbal Lubys is based in the Special Region of Yogyakarta, the centre for arts in Indonesia. In addition to his academic study of classical music and classical guitar, he is active in several art and experimental music communities. His work frequently exploring further how the guitar can be played and developed, both in terms of sound and visually. A noted player at concerts, he has collaborated widely with artists in Asia and Europe, including making music for dance and film. Lubys is also a member of Instrument’s Builder’s Project (TIBP), a collective of experimental Indonesian musicians and artists. TIBP work with traditional craft-based and avant-garde approaches and technologies, Their work draws from experimental music, sound sculpture, installation, conceptual and instructional work and performance art.